Season 4 may have marked the end of the American series of Transformers [G1], but Japan had many more stories to tell! 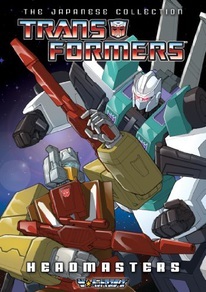 Transformers: Headmasters replaces the Gen One 4th season and begins one year after the end of Season 3. Optimus Prime lives again, the energy of the Matrix has been released, and peace reigns on Cybertron... but all that is about to change with the startling arrival of the newest bred of Transformers warrior - the Headmasters!